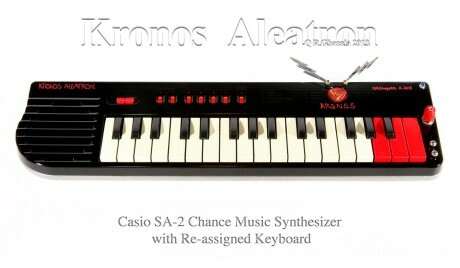 Though not quite a quartet in number, the digital “musicians” behind the chance music generation of a bent Casio SA-2 are similarly focused in that, once the keyboard’s Change Trigger is pressed, a cohesive composition is performed by this small, but introspective, group. Their performance might evolve through astounding changes, instruments limited to, say, piano, drums and flute, all players continually sensitive to each other’s work. Or so it seems. Deviations from the “book version” are as follows:Lightning Bolt Body Contacts. These are touched to nudge chance compositions gently along, slowly changing their musical course. The chromed contacts swing down alongside the red lens when not in use.Red lens is an antique Czech glass button finished in silver and gold. The thin red glass is back-lit by a volume-peak LED. 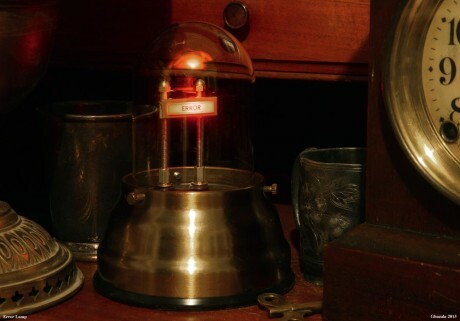 The blue Power LED is housed in a 1960’s mini-incandescent pilot lamp hacked to accept the tiny LED. Vintage red calibration dial is adjusted to increase/decrease the Chance Trigger’s power threshold. Spherical Body Contacts are chrome balls with threaded holes for mounting and electrifying. These are more sensitive than the lightning BCs. A – Starts Demo tune. B – Chance Trigger (deconstructs Demo into aleatoric sound movements). C – Reset (tap after a crash, tap A to begin Demo and start routine again). Chance triggering is now refined to a smooth and efficient operation, all important controls grouped within 1/2″ of each other. No push-button switches added to the instrument. Casio’s strange color scheme of grey/orange/green has been replaced with a simple gloss red and textured gloss black. Bottom of case is finished in “nickel-satin” and looks very aluminum. The re-assigned keys are game-changers. Simple. Powerful. Fun. This Error Lamp turns on whenever someone in Congress makes a mistake. But it did go dark once. To protest a Congressional consideration to weaken the Clean Air Act I’d stopped paying my utility bill. :Alex, this is a vintage neon “ERROR” indicator monumentalized in this simple sculpture. The supportive members are live 110V conductors. Base is a scrapped ceiling light fixture, upside-down. As the examination of “mistake” has pressured the concept of circuit-bending, I am comforted by its warm glow, dramatized here. Senate aside, there’s just an on/off switch on the cord. Custom Reset Switch finished in Cautionary Red with vintage gold hardware. Vintage Green Glass Photo Cell Lens. This is an adjustable-shutter pilot light lens, military-spec avionics, 1950’s surplus, used here to vary ambient light reaching the vibrato photo cell behind it. Activated via toggle switch to left, vintage gold hardware. Custom Light Show. This is a three-layer rotating fractal mandala backlit with color changes and a central violet sound-envelope LED (pulses with the chants as colors/patterns change around it). This animated lighting system is based on my Starve & Share Voltage Flanger. Once the associated DIY film is ready I’ll get into that here. Brass Body Contacts. Instead of wiring these to the usual pitch points (raises freq) these are connected to SPK (-) and Song push-button frame. These contacts lower the pitch when touched, nice in contrast to the raised pitch of the photo cell (increases circuit stability, too). 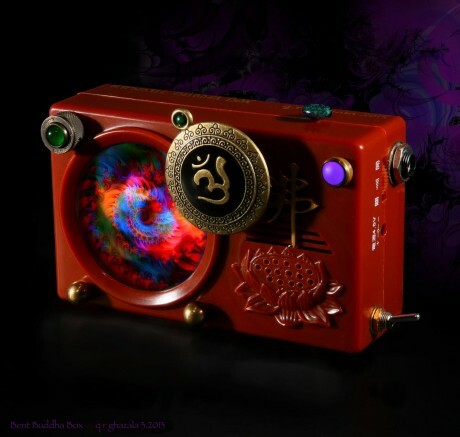 Custom “OM” Frequency Dial. Behind this dial is a 5-Meg mini-pot allowing passage into “sub-sonics,” the freaky re-resolved chants that reside below basso. The reference gnomon is inset with a turquoise bead. (DIY: Any such thing can be used as a dial. Find a plastic knob with brass sleeve and set screw. Crush it in a vise. Salvage the sleeve; epoxy it to the back of your object). Custom Song Button. Matching turquoise. Vintage White Milk Glass Pilot Light. White lens is mounted in brass and is back-lit with changing hues of red-violet-purple (again, part of the voltage-flanger circuit). Speaker Switch with vintage gold hardware. Full-sized 1/4″ output jack wired to audio section of board (line-level is constant regardless of volume dial or speaker switching). Aesthetics were guided by existing color scheme and music (all my added components followed the bronze/gold theme where possible; the beautiful green of the adjustable lens was picked-up by the light show discs and turquoise stones). In use, the instrument is set on its back, controls arranged accordingly with dial, sensor and contacts facing upward toward the musician. The potentiometer has super-smooth action. It can be easily adjusted with one finger while the other hand plays BCs and photo cell. Via the pitch dial, all 29 chants have several viable, and very different, iterations. Very fun, very psychedelic sound machine. This is the 2013 Pink Moon poster. 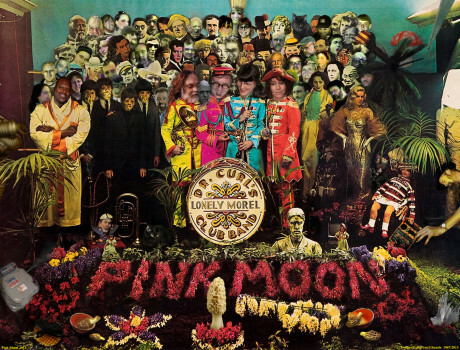 Pink Moon is part of the circuit-bending continuum. Each year there’s a weekend-long party full of experimental music, mushroom hunts and Happenings. There’s also a Secret Guest contest. The prize is usually a bent instrument — the Pink Moon Aleatron, the Thereglyph and The Fractal Oscillator with magnetic patch bay were a few of these. Anyway, you may know a bender hidden in this pic… you may spot Nebulagirl, Spunky Toofers, Jay Wilson, Mike Hancock, Mark Shafer, Marc Sloan, Aaron Sloan, Juan Matos Capote, Mark Milano, John Van Eaton, Derek Sajbel, Josh Litz (see my book), Thejunkyard Catalyst, “The Q,” Pat Ward and Nick B. Wood. Just a little fun. See the “Highlights for Children – Hidden Picture” version on my FB page for a list of other people and items hidden in this pic.